When it comes to outdoor activities of all kinds, you should always have a flashlight with you, but not just any flashlight, a tactical LED flashlight. When things get rough or just get dark, a bright, high powered, and a durable flashlight is exactly what you need. 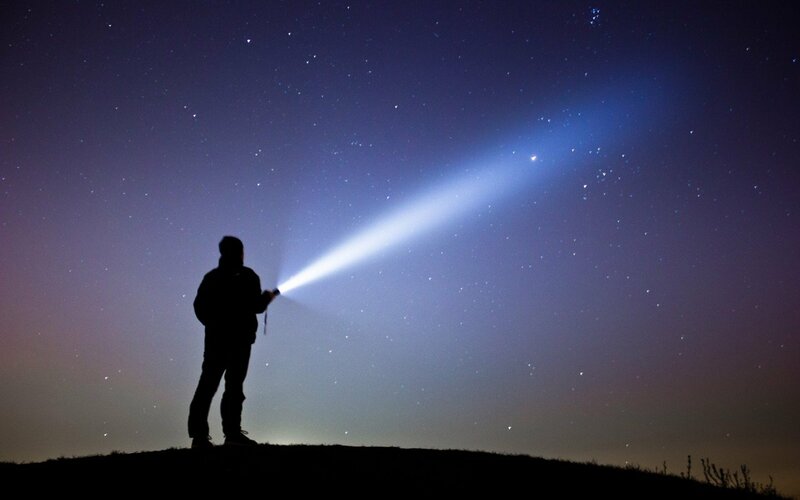 Whether for camping, hiking, mountaineering, boating, for security purposes, law enforcement, or anything else of this nature, having the brightest tactical flashlight is always better than being without. Making a choice and finding the right model for you can be hard though, which is why we are here to help. Let’s get right to it and talk about the best tactical flashlights out there right now. Tactical flashlights are a great tool for any member of the armed forces, the police, firefighters, hunters, hikers, campers, and so much more. A good flashlight can help you find the way, it can keep your friends and family safe, and it can help you find your target too, whether human or otherwise. To help you do all of these things plus more, let’s take a look at the top 10 best and brightest tactical flashlights out there right now. J5 Tactical is very well known for making some of the best tactical equipment around. It is a trusted and reputable brand which has definitely not failed to deliver a high-quality product in the J5 Tactical V1-Pro Flashlight. This thing is bright, it’s lightweight and convenient, and it lets you choose from several different lighting modes too. First of all, the J5 Tactical V1-Pro Flashlight has a great level of power. This is a fairly bright flashlight and on its highest setting it puts out 300 lumens of light energy. This is more than enough power to send a beam of light up to 600 feet. That is longer than 2 whole football fields, which is quite impressive no doubt. It makes for an awesome option when you go camping or hiking. Seeing the path in the woods or just cooking some dinner in the dark is easily done when you have the J5 Tactical V1-Pro Flashlight on your side. It also makes for a great option for mountaineering, for hunting, and so much more. Finding your prey in the night is no challenge when you have a bright beam of light to blind your target. The J5 Tactical V1-Pro Flashlight does also have a low light mode beside the high light mode. This mode puts out a little less power at a shorter distance, but it can be pretty useful too. It’s great for those activities where you need some illumination, but don’t need to see several hundred feet in distance or blind some prey. The J5 Tactical V1-Pro Flashlight even comes with a strobe light mode, which can come in handy for nighttime cycling. This strobe mode is also great for disorienting prey such as deer, plus it can come in fairly handy in rescue situations too. A really bright strobe light is a good way to signal rescue crews when you are trapped on a mountain or lost in the woods. What is pretty cool about the J5 Tactical V1-Pro Flashlight is that it does have a zoom function. This means that you can zoom in to create one very narrow, super bright, and a far-reaching beam of light for target location and to see far distances in general. You can also zoom out to create a wider and less concentrated beam of light, which is great for illuminating a whole area close to you, such as your campsite. The J5 Tactical V1-Pro Flashlight does have decent battery life. If you have this flashlight on high mode, you will be able to get a little more than 1 hour of life out of it. Now, that is not too fantastic, but still better than many other options out there. If you use the low light mode, the J5 Tactical V1-Pro Flashlight can last for up to 4 hours, which is quite a bit better. This particular flashlight can operate on a single AA battery, which is quite convenient. It can also run on a 14500 Rechargeable battery, which is useful too. You can use the rechargeable battery and take your charger with you no matter where you go. However, when you have nowhere to plug the charger in, you can always use the disposable batteries as a backup. The J5 Tactical V1-Pro Flashlight is also a very convenient option to go with for several reasons. It is very small and compact, making it easy to carry around no matter where you go. It can easily fit in a pack or in your pants pocket, plus it is so lightweight that you will barely notice it being there. 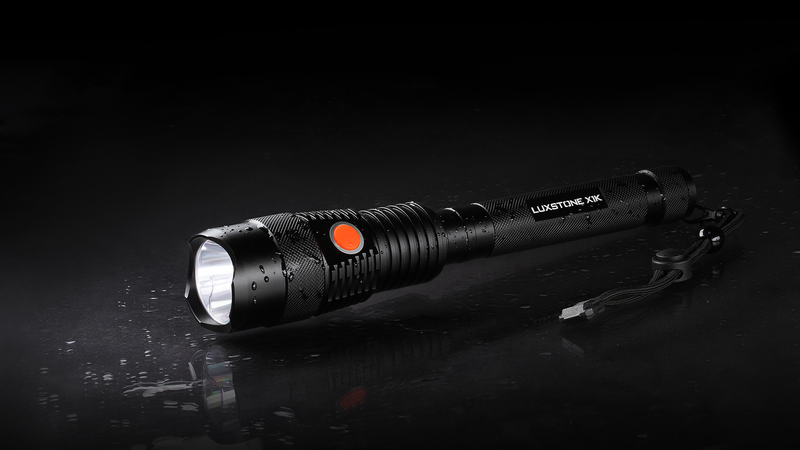 The J5 Tactical V1-Pro Flashlight does also have a textured exterior which helps give you a good grip on it. 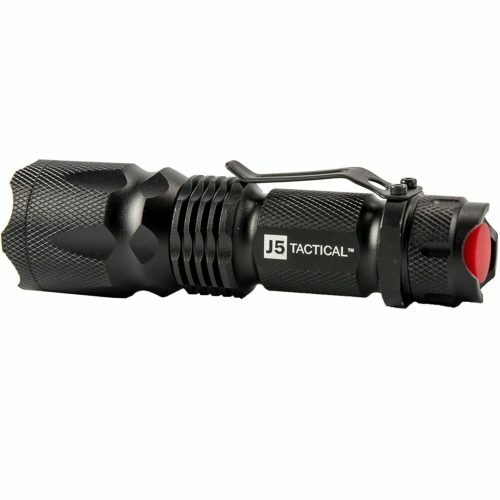 At the same time, the J5 Tactical V1-Pro Flashlight is very tough and durable. It is made of only the highest quality materials and has a very rugged exterior in order to make sure that it stays in one piece for as long as humanly possible. It highly impacts and scratch resistant, which comes in fairly handy in outdoor situations. On a side note, there is an upgraded version of the J5 Tactical V1-Pro Flashlight, which is called the J5 Hyper Tactical Flashlight. 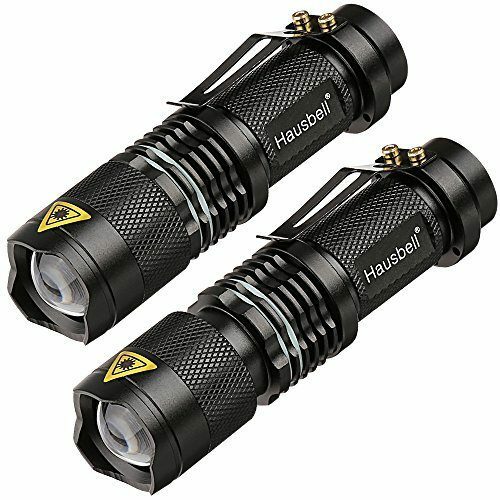 The main difference here is that they Hyper version has 400 lumens of power and can reach out to 800 feet, as opposed to the 300 lumens and 600-foot range of the regular J5. Another highly trusted brand name, PeakPlus delivers high-quality equipment no matter what the case, something which they have proven yet again with the PeakPlus Super Bright LED Tactical Flashlight. This bad boy is very small and compact, it has lots of different lighting modes, it zooms, and it is extremely bright too. Whether for hunting, camping or for a security job position, the PeakPlus Super Bright LED Tactical Flashlight will always illuminate the way. If brightness is what you are looking for, this is definitely a great option to keep in mind. The PeakPlus Super Bright LED Tactical Flashlight is a 1000 lumen flashlight. In other words, it is far brighter than the J5 we looked at above. On its highest setting, the PeakPlus Super Bright LED Tactical Flashlight can put out a 1000 lumen beam of light up to 500 meters in range. As you can probably tell, this flashlight is much brighter and farther reaching than the J5 we just looked at above. It’s a great option if you need a super bright and far-reaching tactical flashlight for camping, hunting, for police activities, fishing, and even just for power outages too. The PeakPlus Super Bright LED Tactical Flashlight does have 5 different light modes including full, medium, low, strobe, and SOS. When it comes to how much light energy is put out over a certain distance, the medium and low modes both put out fewer lumens and have a shorter range, respectively, than the full mode which puts out 1000 lumens over 500 meters. The low mode still puts out several hundred lumens, but it can only reach 200 meters, which is still not very bad. The low mode on this flashlight is as high as the highest mode on the J5 tactical. What is also pretty cool is that you can zoom with the PeakPlus Super Bright LED Tactical Flashlight. This means that you can adjust the beam to be very narrow, concentrated, bright, and far-reaching, or you can zoom out for a wider and less concentrated beam of light that is ideal for lighting up a large area close to you. Back to the strobe function, this is very useful for cycling or boating, plus it comes in handy for disorienting your target, whether a deer or a thief. Plus it also makes for a good signal. However, if you are in trouble and need to signal for help, your best bet is to use the integrated SOS light function which comes included with the PeakPlus Super Bright LED Tactical Flashlight. This function sends out a far-reaching SOS signal so emergency crews can see you. Being stranded on a boat, on a mountainside, or being lost in the woods is not fun, but a good SOS signal can make all of the difference. 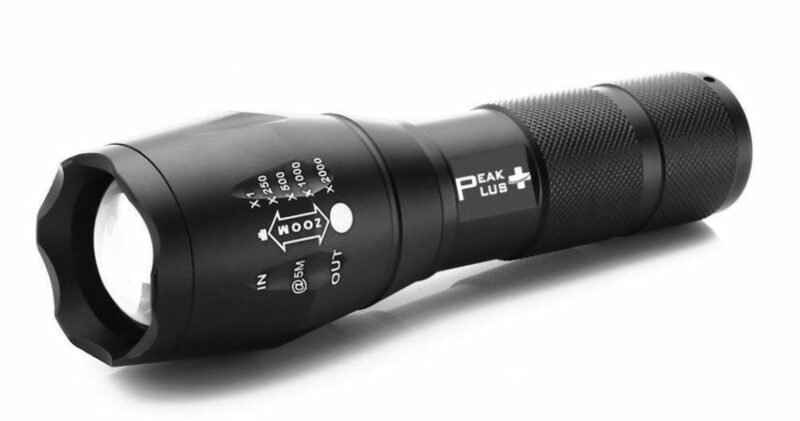 The PeakPlus Super Bright LED Tactical Flashlight is a very tough and durable flashlight no doubt. It features an aluminum alloy exterior, which is a great material for flashlights. It helps to keep this tactical LED flashlight in one piece thanks to a high level of impact and scratch resistance. The PeakPlus Super Bright LED Tactical Flashlight is also water resistant. Now, you can’t submerge it in water, but a rainstorm won’t damage it. On a side note, the exterior of the PeakPlus Super Bright LED Tactical Flashlight is also resistant to shock, which is an added bonus no doubt. Durability is a big factor when it comes to any kind of outdoor or physical activity, whether it be hunting, chasing down a suspect, or camping in rough terrain. We do like that the PeakPlus Super Bright LED Tactical Flashlight can run on 3 x AAA batteries, which are disposable. You can also use the included 18650 Battery, which is actually rechargeable. Having backup disposable batteries is always great when you might not have a charger around to load up the rechargeable batteries. The PeakPlus Super Bright LED Tactical Flashlight can last for a bit over an hour on the high mode, or it can last for many more hours if you use the medium or low modes. On a side note, the battery charger comes included, which is always nice. There is a reason why so many different occupations and recreational activities around the world use the SOLARAY PRO ZX-1 Professional Series Flashlight because it is one of the best out there. This particular model is one of the brightest tactical flashlights that we have looked at so far, and is, in fact, the brightest when compared to the previous 2 models we looked at, the J5 and the PeakPlus. Security officers, armed forces, police officers, firefighters, campers, hikers, mountaineers, and so many more people trust the SOLARAY PRO ZX-1 Professional Series Flashlight to illuminate whatever needs to be seen at all times. The SOLARAY PRO ZX-1 Professional Series Flashlight can put out a beam of light with 1200 lumens of light power over several hundred meters. In fact, this is the brightest and furthest reaching flashlight on this list so far. The high power mode is more than enough to see several hundred meters in distance with ultimate clarity, which is great for finding your path in the woods, for finding your hunting prey, or for locating hiding criminals too. The SOLARAY PRO ZX-1 Professional Series Flashlight does have a total of 5 light modes, 4 besides the high mode we already talked about. This flashlight has a high, medium, low, strobe, and SOS light mode. When it comes to power and distance, the medium and low light modes, respectively, put out a lower amount of lumens and have a shorter effective range than the high mode. However, this does also mean that you can preserve some battery. The high mode is ideal for intense situations, but for things like a stroll in the dark, finding your way down a dark staircase, or reading a scary story around the campfire, both the medium and low modes are more than enough. Just like with the PeakPlus model we looked at above, we do like the strobe and SOS light modes of the SOLARAY PRO ZX-1 Professional Series Flashlight. The strobe mode is ideal for disorienting prey, blinding targets, and for sending signals to people, plus it comes in handy for cycling too. We can’t stress enough how much we appreciate the SOS function because it can make the difference between life and death in certain situations. Having an SOS beacon for rescue crews to see can definitely save your life. 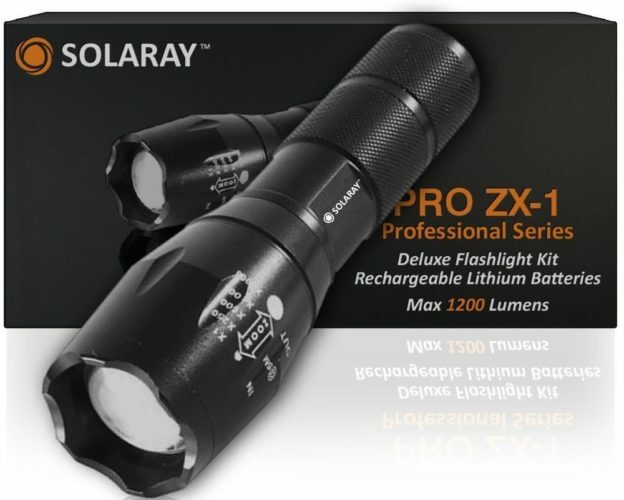 What is also neat is that the SOLARAY PRO ZX-1 Professional Series Flashlight comes with a variable zoom mode. There are various zoom levels to choose from, all the way from a very narrow, bright, concentrated, and far-reaching beam to a very wide, not so concentrated, and not very far-reaching beam of light. One is great for seeing distance and for locating specific targets, whereas the other is best for illuminating large areas such as your campground or living room during a power outage. Another thing about the SOLARAY PRO ZX-1 Professional Series Flashlight which is ideal is the fact that it can operate using the included long-lasting Solaray rechargeable 18650 lithium-ion battery or with normal disposable AAA alkaline batteries. Having options is always nice. Yes, being able to use rechargeable batteries is nice, but you are not always going to have a power outlet handy, so being able to pop in a couple of disposable batteries is pretty convenient for sure. On the highest setting, when using the rechargeable lithium-ion batteries, the SOLARAY PRO ZX-1 Professional Series Flashlight can last for well over an hour. On the lowest mode, you will get closer to a whole day of use out of a single charge. Yet another cool aspect of the SOLARAY PRO ZX-1 Professional Series Flashlight is that it is made out of professional high-quality aircraft grade aluminum alloy. When it comes to tactical LED flashlights, there is really no better material. It is high impact resistant, shock resistant, and scratch resistant too. The beauty of this material is that it brings you a good mix of durability and lightweight. The SOLARAY PRO ZX-1 Professional Series Flashlight weighs almost nothing at all, making it almost unnoticeable to carry around with you. 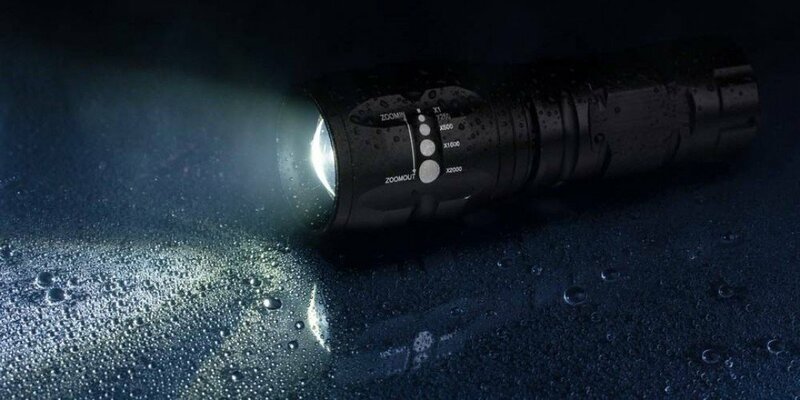 At the same time, this flashlight is also very water resistant. Now, once again, don’t go diving with it or leave it lying in a puddle of water, but a simple rainstorm or some damp conditions won’t cause water damage. The SOLARAY PRO ZX-1 Professional Series Flashlight is small enough to carry with you in your utility belt, camping pack, or just in your pockets too, yet another convenience factor to keep in mind. EcoGear has been around for quite a few years now and when it comes to making outdoor camping, hunting, and hiking equipment, these guys definitely know what they are doing, as evidenced by the great EcoGear FX Tactical Flashlight. When it comes to any kind of outdoor activity when the dark is involved, having this particular flashlight in your arsenal can help make life a whole lot easier in many different ways. This thing has some great features, so let’s talk all about them right now. The EcoGear FX Tactical Flashlight is actually just as bright and powerful as the SOLARAY which we just looked at. To start off, the EcoGear FX Tactical Flashlight does have a variable zoom function so you can change the concentration of the beam. You can zoom out to make a wide and not so concentrated beam which is ideal for illuminating large areas close to you. You can also zoom in to create a super bright, concentrated, and a far-reaching beam of light. One is ideal for up close situations like being around the campfire or taking care of a power outage at home, while the other is great for seeing far distances, winding paths, and locating targets. The EcoGear FX Tactical Flashlight does come with 5 different light modes, those being high, medium-low, fast strobe, and SOS. On the highest setting, while zoomed in, this tactical LED flashlight can put out up to 1200 lumens of light power, plus it can reach several hundred meters in distance, just like the SOLARAY we just looked at before. If you have the EcoGear FX Tactical Flashlight on the highest setting but have it zoomed out, the effective range is decreased a little bit with the 900 lumens of light power being emitted. The highest setting is great if you need to see far into the distance and really light up whatever you are pointing at. Respectively, the medium and low modes each put out less light power and they cannot reach as far either. This is good because you have options for every situation. If you are reading in your tent you probably only need the low light mode. The advantage here is that you can save battery power when possible by using the lower light modes. We do also like the fast strobe setting, which is more than ideal for blinding prey and targets, disorienting them, and for sending a signal too. However, the SOS feature is what you will want to use if you get into a sticky situation. The SOS beacon is awesome if you are stranded somewhere and need a rescue crew to find you quickly. On a side note, if you use a certain mode for at least 6 seconds, then turn the EcoGear FX Tactical Flashlight off for at least 6 seconds, the smart memory feature will remember that same setting and go right back to it when you turn the flashlight back on. We do really like how the EcoGear FX Tactical Flashlight operates with 2 included rechargeable batteries, plus the battery charger comes included too. Having rechargeable batteries is always nice because it allows you to save some money, plus it is good for the environment too. That being said, in case you do not have access to electricity, you can always use 3 x AAA batteries to power the EcoGear FX Tactical Flashlight, which is great for emergency situations. Off of full charge, you can easily get over an hour of light on the highest setting, and on the low setting, you can get several hours of light on a single battery charge. On a side note, the EcoGear FX Tactical Flashlight features a constant current and voltage circuit design which helps protect the LEDs from power surges. Something else that stands out about the EcoGear FX Tactical Flashlight is that it is very durable. This bad boy is constructed of aircraft grade aluminum alloy and features a hard anodized finish. This makes the EcoGear FX Tactical Flashlight one of the toughest and durable options on this list so far. It is extremely resistant to impact and scratching, it is scratch resistant, and water resistant too. 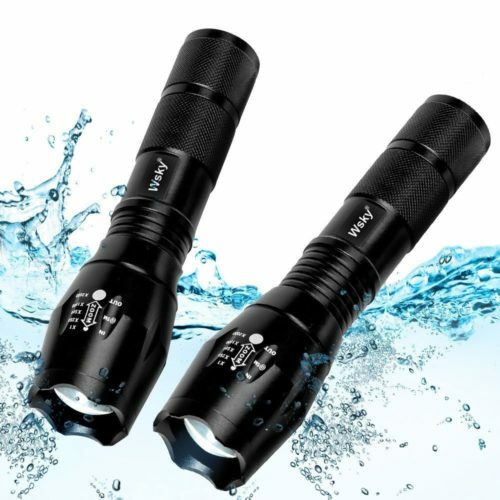 Just like with all of the other water resistant tactical LED flashlights that we have looked at today, this one can survive a rainstorm or damp conditions, but don’t try submerging it because it cannot handle that. If you are on the hunt for a trusted brand name that makes quality products day in and day out, you should definitely check out the Hausbell 7W Mini LED Tactical Flashlight. As the name implies, this is one of the smallest and most compact brightest tactical flashlights on the market today. It might be small, but small does not mean that it is not mighty. It is not the brightest option on our list today, but it is definitely a convenient one. One of the features that we like the most about the Hausbell 7W Mini LED Tactical Flashlight is indeed that it is so small and compact. When it comes to carrying this little guy on your belt, in your tactical vest, in your camping pack, or just in your pocket, there is not going to be a problem. It’s only a few inches long and not even an inch wide. You can literally fit the Hausbell 7W Mini LED Tactical Flashlight right in the palm of your hand. On that same note, this little guy is also extremely lightweight at the same time. It is so lightweight that you might just forget that you have it with you, even when it is right on your person. It also comes with a little clip so you can clip it onto a pocket or belt loop for easy carrying. Another thing about the Hausbell 7W Mini LED Tactical Flashlight which is pretty neat is that it has a variable zoom feature. This is not something which we would usually expect such a small flashlight to have, so this is fairly impressive. You can choose between a really wide and concentrated beam for lighting up large areas close to you. You can also choose from a more concentrated, brighter, and farther reaching beam for locating targets, paths, and anything else at a far distance. Having this kind of choice is something that we always like. Even though the Hausbell 7W Mini LED Tactical Flashlight is small and lightweight does not mean that it is not tough and durable. This particular tactical LED flashlight is made out of top quality aluminum alloy and is finished with a special coating. Thanks to its high level of impact and scratch resistance, dropping the Hausbell 7W Mini LED Tactical Flashlight on the ground from a decent height won’t break it. It won’t even get scratched. This flashlight is also shockproof, which is a pretty big bonus. At the same time, this particular tactical flashlight is also highly water resistant. Now, it is not waterproof, so you can’t submerge it underwater for any amount of time, but some moisture or even a rainstorm are not going to cause electrical failure. The Hausbell 7W Mini LED Tactical Flashlight does have 3 light modes, these are bright, lower brightness, and SOS. It may not have as many modes as some of the other options we have looked at today, but they still work just fine. When totally zoomed in an on the highest light mode, the Hausbell 7W Mini LED Tactical Flashlight can put out around 300 lumens of light power, which is still way more than your average flashlight. It can easily light up several hundred feet in front of you in this mode. The lower mode does, of course, put out a little less light, and thus it can also not reach as far as the highest setting, but this does also help preserve battery life. Whether you need a little bit of light at a close range or a lot of light at a far distance, the Hausbell 7W Mini LED Tactical Flashlight has got your back. It also has your back thanks to the SOS feature. Being trapped on a mountain, lost in the woods, or stranded on a dead boat is never fun, but if you have an SOS signal, emergency crews can find you before time runs out. Speaking of battery life, the Hausbell 7W Mini LED Tactical Flashlight can last for several hours on the highest mode, and much longer on the low mode. It uses a 14500 rechargeable lithium-ion battery or one AA battery. This is convenient. We always like when we can use rechargeable batteries because it is easier on our wallets. However, having a backup disposable battery option is always great for those times when you don’t have access to an AC outlet before the rechargeable battery dies. 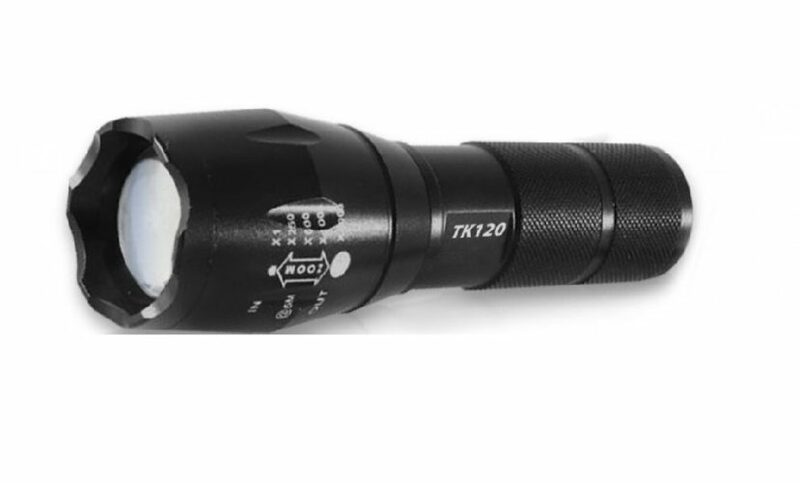 If you need a really tough, rugged, and durable tactical flashlight for camping, hiking, hunting, or anything else of the sort, the YIFENG XML T6 Ultra Bright LED Taclight is a really nice option to consider for various reasons. YIFENG might not be a brand name that you are closely familiar with, but after you see what the YIFENG XML T6 Ultra Bright LED Taclight can do, you might decide to familiarize yourself with it a little more. When it comes to power and brightness, the YIFENG XML T6 Ultra Bright LED Taclight is the most powerful on our list so far. When on the highest setting, this bad boy can put out over 1600 lumens of light power, which is definitely a whole lot of illumination. When zoomed in and on the highest setting, those 1600 lumens of light energy can reach out to 600 feet, which is very impressive no doubt. The power and distance of this little tactical LED flashlight are very good. There is still a lot more to be said though. The YIFENG XML T6 Ultra Bright LED Taclight does have 5 different lighting modes. These modes include high, medium, low, strobe, and SOS, or in other words, it has all of the lighting functions that you would expect from any good tactical flashlight. Respectively, the medium and low light modes do not emit as many lumens as the high mode, nor do their beams reach as far, but this is good for various things. First of all, you don’t always need maximum illumination. There is no point in blinding yourself and others around the campfire with your high beams. Sure, the high mode is great for seeing far into the distance, especially when it comes to hunting, camping, hiking, and target location. However, for simpler tasks at a closer range, the medium and low settings will do just fine. There is also the fact that those settings require a lot less battery power than the higher setting. Back to the strobe feature, this is one that we always like because it is useful for various things. 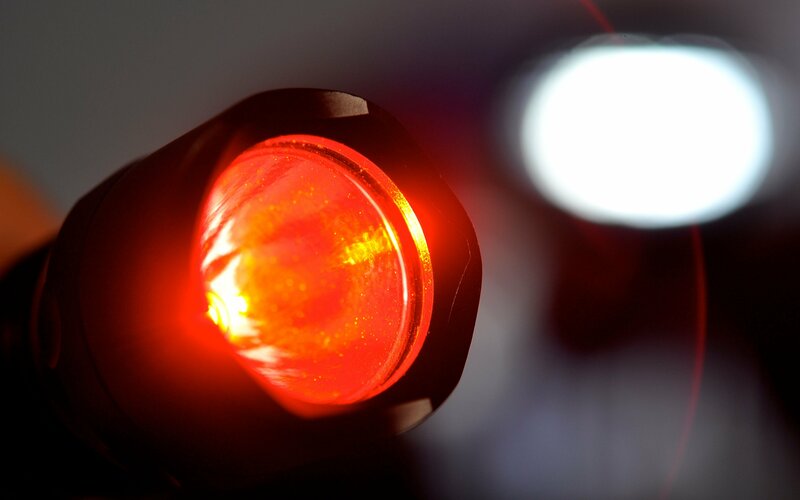 The strobe function is especially good for hunting and disorienting your prey, plus it can be used by armed forces and police to blind a criminal target. We also like the SOS function because it can literally save your life. The SOS beacon can alert rescue crews in the area to your location, whether stranded on a boat or on a mountainside. It can make the difference between life or death when things get hairy. When it comes to the functions of the YIFENG XML T6 Ultra Bright LED Taclight, we do also like the variable zoom feature. You can zoom in to create a really narrow, bright, and concentrated beam of light with a whole lot of lumens and distance. It’s great for seeing things in the distance. On the other hand, you can also zoom out to create more of a floodlight effect for seeing wide swaths at a shorter distance. It’s a good option for lighting up a home during a power outage or lighting up the campsite too. Yet another thing that stands out about the YIFENG XML T6 Ultra Bright LED Taclight is that it is built to be tough and durable. As seems to be the standard for most tactical flashlights, this one is made of high aluminum alloy with a solid coating for a finish. In other words, dropping this flashlight or bumping it into something is no problem at all. It has a very high level of impact resistant and scratch resistance, plus it is shock resistant to boot. On that same note, the YIFENG XML T6 Ultra Bright LED Taclight has an IPX-6 waterproof rating. So, while you cannot fully submerge this flashlight, a bit of rain and moisture will not cause it any harm. Finally, the YIFENG XML T6 Ultra Bright LED Taclight is also very small and compact. It is lightweight, so you will barely notice that you have it on your body. It is so small that you can easily fit it into virtually any pocket that you have. Convenience is another big selling factor here. When it comes to the title of the brightest tactical flashlight around, the Uoline Tactical Portable LED Flashlight is definitely a top contender. One of the things that really stands out about this particular flashlight is that it seems to be oriented towards survival. Yes, it can be used for many things like hunting, fishing, biking, boating, camping, hiking, and can be used by various security professional and armed forces too. However, the Uoline Tactical Portable LED Flashlight really shines in terms of survival situations. Let’s just focus on the survival and outdoors aspect first, since we did just bring it up. One of the things which really helps here is the fact that the Uoline Tactical Portable LED Flashlight can use both rechargeable and disposable batteries for power. Sure, having rechargeable batteries is nice because it allows you to save some money and it is good for the environment too, plus there is the fact that this particular flashlight can last a good while with the rechargeable battery. However, you might run out of juice, and worst comes to worst, when you have no power source around you for charging, you can always use some disposable batteries too. In terms of the battery power, when on the highest setting, the Uoline Tactical Portable LED Flashlight can last for close to 2 hours, which might not sound like all that long, but is actually quite impressive. If you use this flashlight on the low setting, which is the battery saver mode, the battery life can last for several days, which is great for weekend camping trips and other such occasions. The Uoline Tactical Portable LED Flashlight comes with a lanyard and carabineer attached to it. You might not think that this is a big deal for those times when things get tough, but it is. The fact of the matter is that a small flashlight can be easy to drop in the outdoors, which is not good at all. However, the carabineer lets you attach the Uoline Tactical Portable LED Flashlight to your person so it never falls off. Whenever you need a flashlight the Uoline Tactical Portable LED Flashlight will always be there for you. This particular tactical LED flashlight is also good for certain survival situations because it comes with a glass breaker integrated into the design. If you have ever had a car accident and need to get out quickly like if you are sinking in a lake, being able to break the glass for a quick escape can make the difference between life or death. This glass breaker is also ideal for fending off unwanted attacks. A good whack to the head with the front of this bad boy is more than enough to send a mugger running for the hills. Also, the Uoline Tactical Portable LED Flashlight has an SOS light mode, which is also great for situations when you need to be found or rescued. Emergency crews are not going to be able to save your life if they can’t see you, but thanks to the SOS light mode on this flashlight, they will always be able to find you no matter where you are. Talking about the light modes, the Uoline Tactical Portable LED Flashlight comes with 5 different lighting modes, including the aforementioned SOS function. It also features a high, medium, low, and strobe light mode. At the highest setting, this flashlight puts out over 1000 lumens of light power, making it one of the brightest tactical flashlights on our list today. It is much brighter than any ordinary flashlight. There is no doubt about that. It can easily penetrate the darkness up to several hundred feet. The medium and low light modes, which are 50% and 20% of the high mode, respectively, are also quite useful. You don’t always need to use the Uoline Tactical Portable LED Flashlight at full power, so being able to save some battery is always nice. Yes, the full power mode is great for really dark nights when you need to see really far, but for simple indoor or campfire activities, the lower settings will do just fine. The strobe light mode is also fairly convenient. It is great for blinding enemies and attackers, plus it can be used to disorient your prey too. Hunting has never been so easy. On a side note, the Uoline Tactical Portable LED Flashlight is also built tough. The aircraft grade aluminum alloy construction combined with a high level of water resistance is really good no doubt. Yet another great high powered tactical flashlight, the GearLight LED S1000 Tactical Flashlight has many different modes and settings which will help make your life much easier. Something that we should not forget is that this is actually a 2 pack of flashlights, so you get a backup in case something happens to the first one, or you can just give one to somebody else in your family. Just like with the other good tactical flashlights we have talked about here today, the GearLight LED S1000 Tactical Flashlight comes with 5 different light settings. These settings include high, medium, low, strobe, and SOS. The high light mode is what we are really paying attention to here. When set on high, and when fully zoomed in, this flashlight can put out 1000 lumens of light energy in a concentrated space, with a beam that can reach up to 1000 feet away. 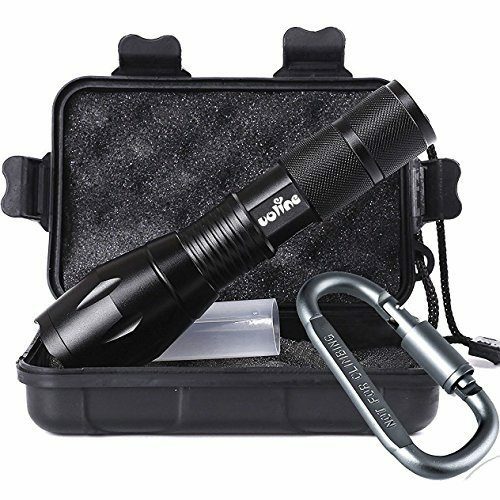 Actually, this makes the GearLight LED S1000 Tactical Flashlight one of the furthest reaching flashlights that we have on this list today. 1000 feet is more than 3 football fields in length, which is quite impressive indeed. This high setting is ideal for seeing really far, such as when you are hiking or camping. If you get lost in the woods, the high powered GearLight LED S1000 Tactical Flashlight can definitely help you find your way. However, for things like cooking around the campfire, reading in your tent, or making your way downstairs in a power outage, the medium and even the lowest setting will do just fine. The advantage here is that you can save some battery power by not using the highest setting when it is not needed. Furthermore, we do like the strobe setting which the GearLight LED S1000 Tactical Flashlight comes with. This strobe setting can be used to allow people to locate you, to disorient your prey when hunting, or to blind your attackers too. Even better for rescue situations is the SOS light mode. This mode sends out the Morse code signal for SOS in order to allow emergency crews to find you. When trapped on a dead boat or on the side of a mountain, this SOS feature can save your life. Another thing about the GearLight LED S1000 Tactical Flashlight that is really neat is that it does have the classic variable zoom function which many tactical flashlights feature. It is really nifty because you can choose to light up the area around you with a wide and not so focused beam of light, or you can zoom in and create a highly concentrated and super bright beam of light that can see far into the distance. The GearLight LED S1000 Tactical Flashlight is great for both long range and short range situations. On a side note, the tactical tail switch is convenient for one-handed use, especially when you really need your other hand for something else. 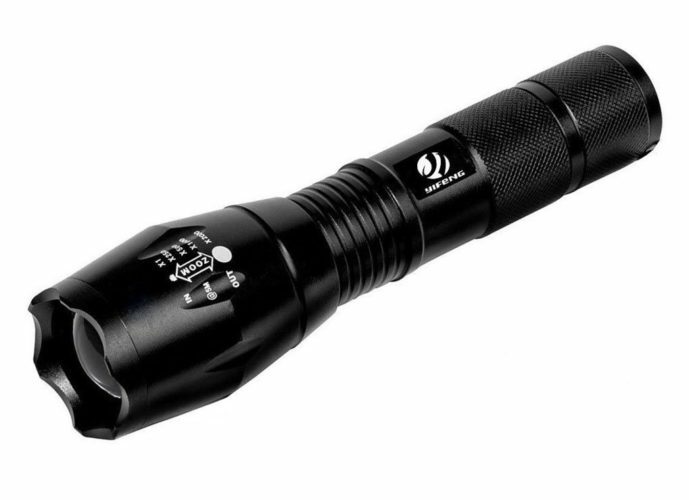 On that same note, the GearLight LED S1000 Tactical Flashlight features an attack head, which is very strong and can easily smash a pane of glass. If you are trapped in a car, this might just save your life. Also, this attack head can be used to defend yourself from unwanted attackers. A good shot with the front of this flashlight can definitely incapacitate a person. This is in part possible thanks to the ultra-tough and rugged design of the GearLight LED S1000 Tactical Flashlight. It is made with the highest quality of materials around, plus it features a special coating for added durability. This particular tactical flashlight is highly resistant to impact, scratching, and to shock too. Dropping it on the ground or using it for defense are not things that will break this flashlight. This flashlight is also weather and water resistant, which comes in handy when you are fishing, camping in the rain, or doing anything in the cold. This is indeed one of the toughest flashlights around. This next option may be one of the last ones on our list today, but it is still a really good choice none the less. It comes with all of the features which you would expect from a tactical flashlight. It is bright, it has many modes, it is durable, lightweight, and easy to use too. When it comes to hiking, camping, hunting, or some kind of survival situation, the LETMY Tactical Flashlight is an excellent tool to have in your arsenal. On a side note, this is a 2 pack of flashlights, so you get 2 LETMY Tactical Flashlights in one box, making it a good choice for family camping trips. 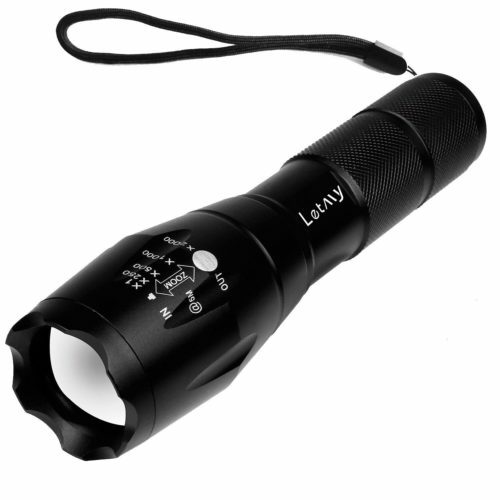 The LETMY Tactical Flashlight comes with 5 lighting modes. These modes include high, medium, low, strobe, and SOS. The highest light mode can put out around 800 lumens of light, which is a fair amount, and it can send the beam of light out to 826 feet, which is also quite impressive. This tactical flashlight is ideal for camping, hunting, and all of that other fun stuff too. On its brightest setting, you can easily see into the distance to locate whatever needs to be found. We do like that the LETMY Tactical Flashlight also has a low and medium light mode. You are not always going to need to turn darkness into total daylight. Sometimes you just want to read, find your way down the stairs, or cook some beans on the fire. For those purposes, the low and medium mode will suffice. Sure, they don’t put out as many lumens or reach as far as the high mode, but that just is not always necessary. The ability to preserve some battery life when you do not require maximum illumination from your light is always nice too. The fact that the LETMY Tactical Flashlight comes with a variable zoom feature is nice too. You can choose between a really bright and concentrated beam of light for seeing far into the distance, or you can choose a more floodlight style effect which is great for lighting up large areas close to you. The LETMY Tactical Flashlight does come with the classic strobe light mode, which is great for a number of different purposes. The SOS light mode is great if you get lost or stranded and need a rescue crew to be able to easily locate you. In terms of safety, the LETMY Tactical Flashlight does come with a glass smasher at the front, which is great if you are ever trapped in a car or building and need to make a quick escape through a window. On that same note, an attacker will think twice of coming at you after you have given them a walloping with the attack head on the LETMY Tactical Flashlight. It is a really solid flashlight, made of high-quality aluminum alloy, so the impact is not a big deal. It also features a certain degree of water resistance too. This is the final option on our list today, but it is still a very good one none the less. The Wsky S1800 LED Tactical Flashlight comes with 5 different light modes. These include the high, medium, low, strobe, and SOS setting. On the highest setting, this flashlight can out over 1000 lumens of light power with ease, plus the beam on the high setting can reach out to around 1000 feet. This makes the Wsky S1800 LED Tactical Flashlight one of the brightest and furthest reaching options on our list today. This mode is great for seeing far into the distance and for locating targets. The medium and low light mode do both put out fewer lumens and have a shorter range than the high setting, but they both us less battery too. It is not always necessary to have maximum illumination, so being able to save some battery power with the low and medium modes is great. These modes are more than ideal for a power outage or for some campfire fun. The strobe mode is excellent for disorienting prey and for signaling people. Plus, the SOS mode might just save your life one day. The Wsky S1800 LED Tactical Flashlight does have a variable zoom function, which is always nice too. You can choose between a very far-reaching and very concentrated beam of light and a wider and less concentrated beam. Whether you need to see a little thing at a far distance or see a lot up close, the Wsky S1800 LED Tactical Flashlight can do it no problem. The battery life of the Wsky S1800 LED Tactical Flashlight is actually one of the best out there. The rechargeable battery included here is very energy efficient and can last for around 2 hours on the highest setting, which not many other models can boast. The Wsky S1800 LED Tactical Flashlight is also very durable. It is designed with high-quality aluminum alloy. This provides this flashlight with lots of impact and scratch resistance. This particular model also has a high waterproof rating, making it great for various climates, weather conditions, and outdoor activities in general. It also makes for a great option seeing as it is very small and compact, plus it has a glass smashing head for emergencies too. Before you go out and spend any amount of money on any tactical LED flashlight, there are some important things that you should keep in mind. Here are the main considerations to make before you make any final purchase. The first thing that you need to keep in mind before buying any tactical flashlight is how powerful it is. This has to do with the number of lumens which the flashlight in question puts out, or in other words, how bright and intense the LED bulbs are. Many of the options we have discussed above are at or around 1000 lumens. There are also some which produce 300 lumens and some which produce as much as 1600 lumens of light power. Now, 1000 lumens is already more than 10 times the brightness level of a normal flashlight, just for reference’s sake. The more lumens the flashlight puts out, the brighter the beam of light, the more you will be able to see, and the greater the distance that the beam will go. A flashlight with 300 lumens is more than good enough for a power outage or for some simple camping. However, for longer camping trips in large forests or for other intense outdoor activities, the more lumens you have the better. Do keep in mind that a higher output also means that the flashlight will use more battery power. This point is somewhat related to the previous one of how many lumens the flashlight puts out, but is also a little different. Depending on the type of bulbs involved, as well as the reflective casing which they are housed in, different flashlights, even ones with the same lumen output, can vary in how far the beams can go. Simply put, you probably want one that can reach as far as possible. Some of the options we have looked at above can reach as far as 1000 feet or more, which is quite impressive. You need to consider what you will be doing with the flashlight before making a choice here. You probably won’t need a model that can reach 1000 feet if all you need it for is in case of a power outage in your home. A feature that we always like to look out for is the variable zoom feature. This is a really neat feature that can add a whole lot of versatility to any flashlight. 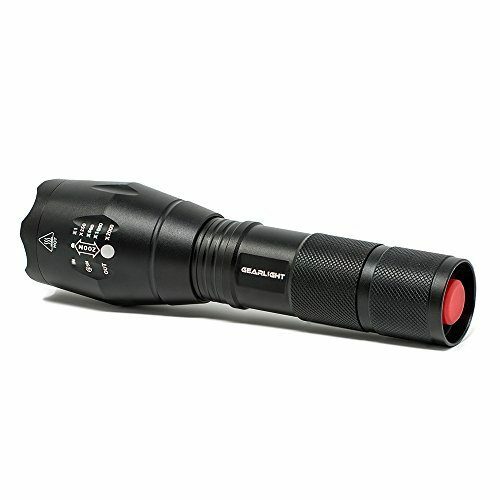 Having a variable zoom feature means that you can change the concentration of light and the width of the beam produced. In other words, you can make the beam really narrow and highly concentrated, which is great for locating small targets and for seeing far into the distance. On the other hand, you can also choose to make the beam wider for more of a floodlight effect. This is best for lighting up wide swaths, such as your living room or your campground. You should probably look out for a tactical LED flashlight that has various light modes. Most of the options we have looked at above generally come with a high, medium, low, strobe, and SOS function. Now, we do like to be able to choose from more than one level of lighting, because sometimes you need a ton of illumination and sometimes you just need a little light to see a book. Being able to choose from a lower setting so you can save battery when you don’t need too much light is always nice. Moreover, having a strobe function is almost necessary for a tactical flashlight. A good strobe light can alert people to your presence, it can disorient prey when hunting, and it can blind enemies who are giving you trouble. Even better is an SOS function, which just sends out a really bright Morse code signal for SOS. This is a really important safety feature in case you happen to get lost or stranded somewhere because it allows rescue crews to easily locate you. Generally speaking, a lighter and smaller flashlight will serve you much better than a really large and heavy one. Yes, a big flashlight might be good for self-defense, but not for much else. You want a flashlight that is lightweight, so light that you will barely notice having it on your body. At the same time, you are already going to have more than enough gear with you, so having a small flashlight that can fit into a pocket is definitely a bonus. Nobody wants to carry around a brick. This may be a small thing, but important none the less. You need to look for a tactical flashlight that has a rough texture on the exterior. You need to be able to grip the flashlight well, especially in wet and slippery conditions. You definitely do not want to lose your brand new tactical flashlight. This is probably one of the most important factors to consider when choosing your flashlight. You should look for a tactical flashlight that comes with rechargeable batteries but can also use disposable batteries. You don’t want to limit yourself to only one option. Yes, using rechargeable batteries is ideal for cost purposes, but you will not always have a power outlet handy, so having some disposables as a backup is always ideal. Also, you should look for a tactical flashlight that can run for 1 hour on a single charge at the very least (on high setting). The tactical flashlight you get needs to be durable. You will be using your flashlight outdoors and things can get rough sometimes. You need to be able to drop the flashlight without fear of it breaking or getting scratched up. The industry standard here seems to be some kind of aluminum allow, or even better, aircraft grade aluminum allow. It is even better if the flashlight in question also has a hard anodized finish. Impact resistance is key here. However, what you really need to pay attention to is how water resistant or waterproof the flashlight is. At the very least, you should be able to use your tactical flashlight in a rainstorm without fear of water damage. On a side note, since we have mentioned self-defense, check out the video below for a tip on using a tactical flashlight for self-defense purposes. At the end of the day, all of the above tactical LED flashlights are top contenders for the title of the brightest tactical flashlight. There are so many situations where a tactical flashlight can come in handy. Be sure to add one to your kit. When it comes to the best tactical flashlights out there, we would definitely recommend checking out any of the above options as we are sure there is one best suited to your needs on this list.